Michigan guide Randy Berndt positions himself on a current seam to keep his fly in the zone during hang-down. 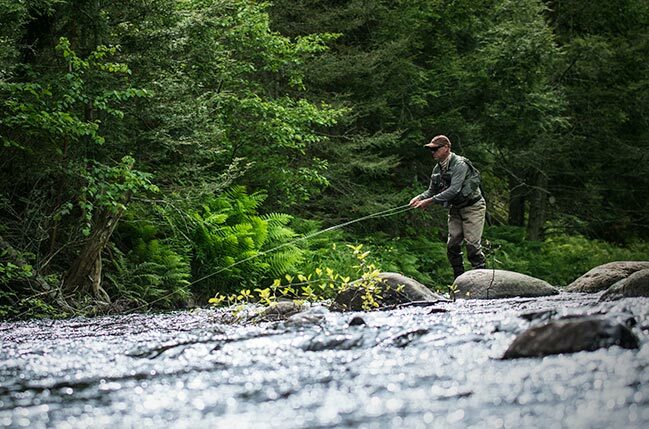 If you’ve recently taken up fly fishing after years of fishing with a spinning or bait-casting rod, you’ve likely noticed a few important differences in your fishing reality, beginning with your casting. Not only are your casts falling a bit shorter than they were before (this will change with time and practice), but all of a sudden your casting takes up a lot more space—a double whammy. It used to be that from your perch on a bank, flush against the trees, you could lob a Rapala across to the far bank with no problem. But stand in the same position with a Murdich minnow, and you haven’t got a chance. Where’s that back-cast going to go? For many people, moving from casting a spinning rod to throwing a fly line can be a bit like swapping out a rifle for a recurve bow. All of a sudden you have to really, really think about where you take your shot from. This is, of course, what you signed up for, right? It’s a more technically challenging approach that has as one of its many purchase prices an enforced awareness of your surroundings. This week’s column is dedicated to those beginning and intermediate anglers still coming to terms with the technical challenges of the sport, especially those anglers coming from the world of gear. You may not be able to add 20 quality feet to your cast overnight, but you can become better at choosing launch points that will make casting more agreeable and fishing positions that will keep your fly in the best water longer. And the only skill you really need is your vision and a good dose of patience. Let’s take a look at a number of things to keep in mind as you feel out the terrain of your local river or lake. Before we can start divining your best possible position in space, we need to establish a working casting distance, which we’ll define as the maximum distance at which you can control your loop and the behavior of your leader. If you can keep things tight at 40 feet but not 50, then fish at 40 feet, even if you can occasionally and sloppily hit 50 through some combination of double hauling and full body spasming. Maintaining proper form is very important to the caster at the early stages of the game, since whatever you do now will form the muscle memory that will either help or hinder you for the duration of your fly fishing career. It could be a the biggest branch in a log jam, a seam behind a boulder, a cut in the weeds, or a slot in the river where pale shallow bottom turns to deep dark blue. Whatever it is, make sure you’re casting to something. Without having a clear target, it’s impossible to identify the best possible casting position, one that takes into account all available constraints (your working casting distance, trees and tall grasses, wind, etc.). If you’re fishing a tree-less, wide open river, then the only thing you really need to take into account is wind. But if you are fishing in an area with trees or tall backside vegetations, you’ll have to involve them in your calculus. Sometimes working around trees involves adjusting the angle of your backcast to avoid them—what’s called a “steeple cast.” Other times, it’s a matter of taking advantage of specific chutes in the foliage. One way of approaching particularly small backcast windows (which will probably look more like tunnels) is to completely invert your casting process. That is, instead of standing with your back to the trees, stand facing the foliage, with your back to your casting target. That’s right, you’ll be false casting into those trees with the tightest loops you can muster, and laying your line on the river during what we’d usually think of as your backcast. It’ll take some work to get accurate with this method, but with time and practice you can get pretty decent at it. Whether overhead casting or roll casting, the depth of the water you’re standing in (or above) is going to make a difference in your casting mechanics. Simply put, the higher your shoulders are above the water, the easier it’s going to be to cast—it’s part of what makes fishing out of a boat so pleasant. Up high, there aren’t too many things that are going to grab your fly during false casting. The same can’t be said when you’ve waded up to your rib cage. The deeper the water, the higher your casting motion. Instead of “swinging the hammer” right around your ear, you’ll be waving it above your head. If that sounds more difficult, that’s because it is. So in addition to choosing your angle correctly, look for the shallowest available water from which to launch your cast. This tidbit is specifically geared to those anglers swinging wet flies or streamers in faster water. As a new angler you probably spend a lot of time swinging flies—and if you don’t, you should. For new anglers, the downstream swing allows you to accomplish the longest casts in your repertoire, since you can always add distance to your “cast” via stack mending once your fly has hit the water. In any case, when looking for the best places to stand when swinging flies downstream, identify the ultimate goal of your cast—where you’d like your fly to end up—and align yourself just off the the side of it, so that a fly rod extended at an angle from your body can hold your fly in that sweet spot for a few seconds at the end of your swing. This is what steelhead anglers call the hang-down part of the swing: that moment when a fly stops its lateral, cross-current movement and simply dangles at rest for a few seconds. This spot you’re aiming for should be the primest lie you’re able to identify: a seam where two currents lines come together, the front side of a boulder, the sweet spot beneath a sweeper where the bottom drops out. Once we have a target identified and casting position staked out, we can begin to think about how to get there. Getting into position is an art you’ll want to get very good at. As mentioned earlier, most likely you’re going to be presenting to fish from a much closer range than before, so what was once moving quickly through the river (or down the bank) hitting your spots from a distance now becomes a practice more closely resembling stalking. Fish have highly developed lateral lines, so if you’re wading the first thing you have to think about is your wake, and how not to push it. And while it goes without saying that moving slowly pushes less wake than moving fast, this can be easier said than done. Moving slowly is much more difficult than moving fast, and it’s here where quality wading gear makes a difference. If you have a pair of boots dedicated to wading, consider some sort of traction enhancer in the form of screw-in studs. If you routinely find yourself in a boat, removable crampons could be the ticket. Furthermore, if the water you fish has quite a bit of fast water with depth, a wading staff will help you move more confidently in powerful flows. Last but not least, a pair of quality polarized lenses makes stealthy, deliberate wading easier. It’s hard to move intelligently through the water when you can’t see what you’re about to step on, in, or through. Another thing to think about is how you can use your immediate environment to your advantage. Think like a hunter: How can you use obstructions to veil your presence? That big boulder is not so much an obstacle as a collaborator: it can break your wake as you get close to your target, and even mask your above-water movements. That logjam can do the same thing. What about broken water? Is there a possibility of putting some broken water between you and your target? Maybe a shallow mid-river hump? These are just a few examples. The point is, always be on the lookout for things to hide behind. The last thing to think about is your height. The closer you get to your target, the lower you should be to the water. You may be surprised at how close you can get to rising fish when you approach them low and slow from a downstream position. I’ve been able to sneak up to wary European grayling by refashioning my body into the shape of a hockey stick with my chin just inches above the water. If that water is shallow enough, you can even drop to your knees and inch forward that way. Obviously, it’s important to mark and memorize the spot you cast to when you catch a good fish. But it can also be useful to make note of where you were standing. That’s because sometimes the place you’re standing will be more obvious to the senses than where you cast, especially on visually monotonous water. On a certain long, seemingly uniform steelhead run I know a root sticking up out of the sand lets me know that I’m about to make the most important cast of the hour. It’s from this launch point that a good cast will have both the location and angle to drift my fly over a subtle mid-river hump where an aggressive steelhead always seems to be hanging out. Last but not least, if you want to get a good blast of relatively easy fishing with a still-developing skill set, consider fishing during extremely low or even no-light conditions. Brown trout, brook trout and even smallmouth respond aggressively to night-time offerings once water temperatures reach late spring levels. At night, the rules change completely, and it can definitely be a morale booster to the beginning angler. You can stand pretty much wherever you want, push a little accidental wake, drop a sloppy cast and still do pretty darn well. It can be amazing to see a fish that once darted away when you got within 60 feet suddenly explode on a fly just a few inches from your kneecaps. Let your success at night serve as an incentive to continue developing your practice during daylight hours.